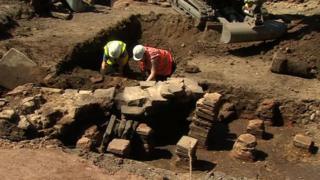 A further dig will take place to uncover the secrets of a Roman bath house site in Carlisle. The remains of a bath house were uncovered in May during work to move Carlisle Cricket Club's pavilion that was damaged during Storm Desmond. So far, weapons, pottery and coins have been uncovered. A local businessman has donated £20,000 and the city council pledged £10,000 towards more extensive excavations of the site. Council leader Colin Glover said: "The find was described as 'premier league' archaeology, and that's something we've longed for in Carlisle. "You look along the whole of Hadrian's Wall and see all those fantastic sites and think 'I wish we had something like that for Carlisle', and then all of a sudden that possibility emerges. "The city council has a role in promoting the city both economically and culturally, and this just seemed a real opportunity to help tell the story of Carlisle."